Honour Among Greens is a simple and extremely light skirmish game meant to teach kids the basics of wargaming, such as moving with a measuring tape, rolling dice, comparing odds, etc. The “miniatures” used can be any type of toys, the most common being plastic green army men, but also toys like knights, cowboys, aliens, etc. Really whatever is on hand. The initial draft of the rules were written at 4:30am. I couldn’t sleep, and had been considering the game for a while, so I got out of bed and put pen to paper. At that point I had some advanced concepts like Command Dice and Fighting Withdrawals. You can see that version above. But then I had a chance to play the game with my 10 year old cousin, so I revisited the rules. I went for a much simpler approach, got the rules down to 1 page, and removed a lot of cruft. The result played well, sparked his imagination. He honestly wanted to add exploding barrels literally 5 minutes into the game, then wrote pages and pages of notes afterwards. So mission successful. The game itself is pretty simple. 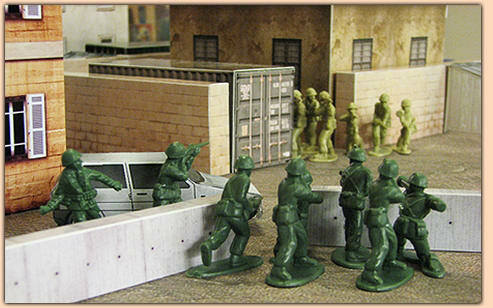 Choose a force of different soldier types and a play area (can be fancy foam terrain, or just around the living room). Objectives are important. Then you alternate moving and acting with any of your soldiers/toys (can be the same one multiple times in a row). Shooting is simple: if you have Advantage you roll D8, otherwise you roll D6, and the enemy target does the same. Whoever gets higher kills the other. So someone is dying (aside from ties). I made a pair of games aimed at kids in the last few years (this and Party of Light) since I wanted to capture the same excitement and spark the same imagination I had at that age. I remember getting Advanced Heroquest and just brainstorming so, so much content for that game, even though I barely knew how to play it. Pouring over White Dwarf magazines from Games Workshop with such eagerness. Oh man, what a time. For all it’s incredible, terrible flaws with their rules, GW will still hold a special place in my heart for introducing me to games. But like a Pixar movie, I also want the game to appeal to adults. And Honour Among Greens achieves that. Potentially more in the “original” vision of the game (as it was more complex), but in a way the trimmed down, simple current rules mean the better strategy, force allocation, and consistent Advantage gain generally wins. In terms of the rules I really like the idea of the defender of a shot being able to kill the attacker. Infinity has a similar idea (just more complex) with their reaction system. I’ve toyed with the idea for Dinosaur Cowboys and Fickle RPG, in fact. But having twice the bloodshed and really having to consider each shot is a fun mechanic and I’m happy Honour Among Green highlights it.